Raina Peterson is a dancer and choreographer trained in the classical Indian dance form of mohiniyattam. 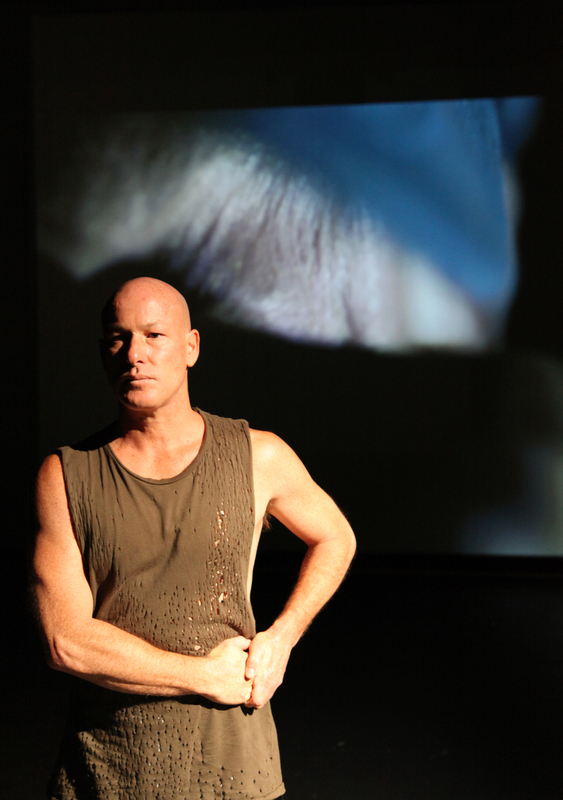 They recently had the pleasure of speaking with multi-disciplinary theatre-maker, dancer, choreographer and puppeteer Jacob Boehme. Jacob is a Narangga and Kaurna man who was born and is currently based on Kulin land. He is Artistic Director of the 2017 Melbourne Indigenous Arts Festival, and Associate Producer of Ilbijerri Theatre Company with whom he is partnering to produce his solo work, Blood on the Dance Floor, which will be premiering June 1 at Arts House, North Melbourne. Raina: Could you please tell us a bit about Blood on the Dance Floor? Jacob: Yes, it’s a solo performance, its been written autobiographically, it takes from my life and the life of my family. It’s pretty much a story about love, about fear, fear of loneliness, and ultimately courage. It’s taken from my experiences as being an Indigenous man who’s lived with HIV for the past eighteen years, so in that way it’s looking at not the things that we’re probably used to seeing around work that touches on HIV or AIDS because most of the work that we do see is about memorialising “the plague” from the 80s. We’ve moved on, we have medications, we live with HIV now, so it’s touching on what we do, what we must face, living with something, and I suppose a lot of people that have chronic illnesses will relate to but more broadly it’s about facing those challenges. It’s like when you fall for somebody and, you know, you want to put yourself out there but you’re not quite sure, you’re scared of rejection, you’re also fearful of being lonely and of not having “the one” and all, it’s a bit like that. Raina: Blood on the Dance Floor sounds like intensely personal work. What were some of the challenges and joys which came out of creating autobiographical theatre work? Jacob: I suppose the main challenge is to make it relatable to other people and that was sort of, you know, separating what I felt I needed to say for my own personal gratification as compared to what would be best for the story so that audiences would understand what I was trying to say. That’s one of the main challenges. The other challenge has been […] right from the start it was always going to be this experiment between theatre and dance and how those two worlds work, but you know yourself as a classical Indian dancer that they do co-exist. […] Narrative and story-telling and movement are just natural partners, really, but when you’re trying to create that for another, for.. yeah, I suppose, Western theatre, that can be a challenge. The joys has been working with a really great bunch of creatives. Raina: Speaking of storytelling, like you said I’m a classical Indian dancer, and in classical Indian dance storytelling and narrative is a central part of the art form, but storytelling and narrative isn’t something I really see much of in the contemporary dance scene here in Melbourne. Can you please comment on its absence, and tell us a bit about why story-telling is an important part of your work? Jacob: I don’t know that I can make any other comment on the absence of narrative and storytelling in the Melbourne dance scene other than, you know, being an outsider – and both of us are outsiders to the Melbourne dance scene, we don’t fit the current scene […] for the past 10 years really – ‘cause the the dance scene particularly in Western-centric contemporary dance seems to be about exploration, experiment and basically just playing with form. So I come out of watching contemporary dance going “Eh, what? And you were saying..?” But yeah, I don’t know what that is. From my training in traditional dance, and with your training, it’s very similar. […] The rule is with the elders: “if you don’t have your story, you don’t have your dance.” What are you dancing for? You dance for a reason, you dance to keep these stories alive, you dance to keep your culture alive, you dance to keep passing on these yarns because that in turn informs you of your place and your belonging […] and so in that respect I think we’re very similar. Raina: Elsewhere you’ve talked about how one of the objectives for Blood on the Dance Floor was to bring Indigenous ways of making theatre to the fore rather than as an afterthought. Could you please elaborate on what you mean by that? Jacob: There is a movement that has been going on for a while within the Indigenous theatre and dance sector – contemporary theatre and dance sector – where we’re bringing some of the foundations of our theatre making process which is 75,000 years old – its ceremony and ceremonial practice, and there are definite methodologies and processes that are used to make that and to… perform, I suppose, that. And so what we were trying to do here is to bring those methodologies and process that are 75,000 years old, not 2000 years old, and make theatre that fits in a space that we understand, not taking our stories and having to abstract them and mould them and completely gut them so that they fit into the Western-Euro way of being able to be understood. […] We gave ourselves permission to be unapologetic about our choices and to reference our culture as we choose, not to explain it all the time. Raina: On your website you talk about how you create contemporary theatre that is influenced and has its foundations in traditional Aboriginal dance and storytelling. Could you please explain to us a bit about the process of how you create contemporary theatre out of traditional culture? Jacob: Well, that practice has come from being invited into communities where traditional dance and practice is at threat of being extinct, so it will normally be an invitation from a cultural centre at the request of elders who are looking to pass on stories, language, song, dance to other generations. Raina: Elsewhere you’ve talked about art not being a choice but a responsibility as keepers and guardians of your communities’ culture and stories. Could you please explain a bit about that? Jacob: So from my training, and from choreographer Mariaa Randall’s training – we went to NAISDA together […] that’s been the rule for, God, thousands and thousands of years: the next generation takes the responsibility to learn, to understand, and then to pass that on to the next generation. So that’s how culture is maintained, it’s not dropped, it’s not forgotten, it’s not lost. And you would understand that too, it’s the same rules as like Tara [Rajkumar] passing on all those songs and dances to you, because now it’s your responsibility, and the next generation of classical Indian dancers in mohiniyattam, to pass that on and keep that tradition alive. It’s the same, it’s exactly the same. It’s just about protecting traditions, and in those traditions that’s where you find your culture’s values and philosophies. Raina: At last year’s National Dance Forum, you protested against the inadequate representation of Indigenous dance at Dance Massive. What are some of the changes that you would like to see for Indigenous dance in Australia? Jacob: Well, I don’t know that it was a protest even though that’s how people reported it, it was more like pointing things out, really. Just sort of making people aware while they’re all talking about inclusivity and diversity that the room wasn’t exactly diverse or inclusive. Just pointing the obvious out, really. And I think the tide is changing. It’d be great… and this would be the same for you again, like, you know, where’s your representation in that world? It’s the same. […] And then if you do get representation in that world or a space in that world, why do you have to adhere to those rules just so that that mob can understand you, you know? That’s all I’m asking. Ok, if you like what we’re doing, then give us the space to grow and move and be. You know? That’s all really, I think. Do you understand? Raina: I do, it’s hard to be a dancer when you can’t really see yourself out there. It was hard for me to make that decision to be a dancer. Jacob: And then, if you do put the work out there, then you’ve got somebody who doesn’t even understand your form critiquing that and to a whole range of people who don’t… who reading that will have absolutely no understanding, so when they get this other version of what you’ve done, and the person that’s written it is not culturally competent enough to have written on it in the first place, then you’ve lost an audience because they’ve got no “in”. Its just frustrating, eh? Raina: I’ve had experiences where my work becomes quite exoticised and sensationalised in this really kind of orientalist lens. Instead of engaging with what’s in front of you, they’ll kind of go off on some imaginary “exotic India” thing. Do you have experiences of objectification? Jacob: Oh God, yeah. That’s probably precisely why we don’t have the sound of a didge or anything in this work, it’s like we’ve just stripped all those symbols that people expect of us. Just stripped it. We’ve gone, “ok, now write about it”. Raina: And finally, do you have any advice for emerging Indigenous dancers? Jacob: Train. Keep training, keep interested, seek out your allies. Yeah, find allies, ‘cause they’re out there. And don’t think you’re on your own, cause you’re not. Blood on the Dance Floor presented by Ilbijerri Theatre Company & Jacob Boehme is on at Arts House, North Melbourne Town Hall from 1-6 June.